But he didn’t stick around long either. By March 1918 he was out of the government, and soon thereafter he fled the Soviet Union (taking with him the above-quoted son, who would grow up to become the legendary art historian Leo Steinberg). Resettled in Germany, Steinberg devoted himself to scholarship and literature (he played an important role in setting up YIVO) until Hitler took over. Fortunately, he was lecturing in London in early 1933, out of reach of the goons who were tasked with hunting down intellectuals like him. Resettled once again in the British capital, Steinberg became active in the Freeland League for Jewish Territorial Colonization, the successor to the writer-activist Israel Zangwill’s better known but by then defunct Jewish Territorial Organization (ITO), which had folded up its tent not long after the establishment of the British Mandate for Palestine. Rovner follows in the footsteps (quite literally, with a lot of zest and a friend who took plenty of pictures) of Steinberg and the other Freelanders as they roamed large parts of Africa, Latin America, and Australia in search of a territory that would serve their purposes in the years prior to World War II, during the war, and even after the war. They achieved their greatest success in April 1947, when the Dutch governor of Suriname agreed to permit large-scale Jewish colonization “with rights of autonomy in local government” in the Saramacca district of the colony. This was too late, of course, to be of any use to the Jews threatened by Nazism, whom the Freelanders had once been desperately eager to rescue. And it was also a time when the Zionist movement, in command of world Jewry and on the brink of achieving its goals, looked askance at any plans that might divert survivors of the Holocaust from Palestine. The prominent American Zionist leader Stephen S. Wise had played a part in helping Steinberg enter the United States in 1941 (not an easy matter for a former Soviet official). But by 1948 he regarded him as an enemy. “I personally believe,” he cabled to a friend, “that Steinberg should be lynched or hanged in quarters, if that would make his lamented demise more certain. He represents a combination of a Messiah complex and anti-Zionism, that appeals, understandably, to many Jews.” As Rovner astutely comments, “For Wise, one of the founders of the NAACP, ‘lynching’ was not an empty image.” Needless to say, nobody was strung up, but the Dutch government, apparently under Zionist pressure, seems to have compelled the local authorities in Suriname to suspend negotiations with the Freeland League at the end of 1948. In The Jewish State, Herzl was quite eager, for obvious reasons, to distinguish his own proposals from what he considered to be the unrealistic dreams of Freiland. 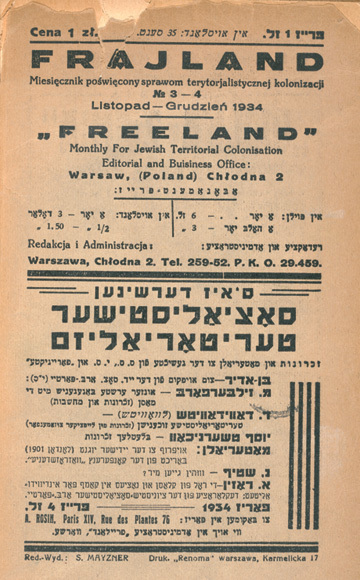 “Even supposing ‘Freiland societies’ were to come into existence,” he wrote, “I should look on the whole thing as a joke.” The Freeland organization that Herzl mockingly foresaw wasn’t established until the early 1930s, and although it borrowed its name from Hertzka’s novel, it did not hearken back to his specific ideas. Still, one can’t help but feel that its final defeat provided Herzl with the posthumous last laugh. 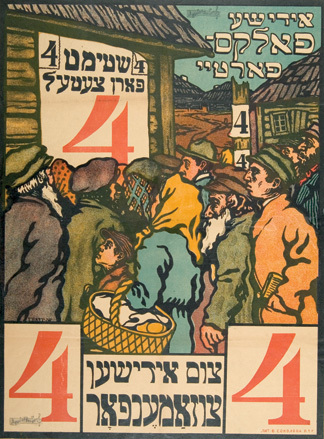 largely a Diaspora-oriented movement, directed primarily toward national cultural work in the Diaspora (i.e., building Jewish national consciousness) and the acquisition of national minority rights, long before Zionism in either Russia or the West had begun to engage in such activity. We want to do what is in our power to decrease our misery, to raise our income, to multiply and increase our political rights, to improve the education of our children, to further the education and vocational training [Ausbildung] of our people [Volksmassen]. 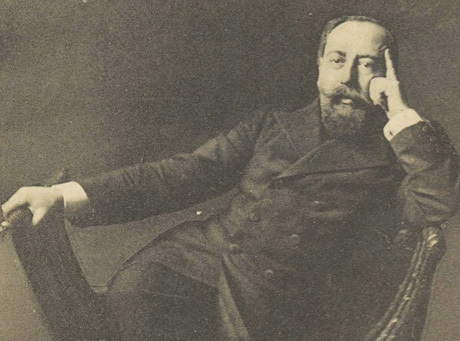 Just a year after Ehrenpreis published his piece—and after Theodor Herzl published his bombshell—Ehrenpreis’ colleague Adolf Korkis wrote a piece for the same journal that made “absolutely no reference to any Diaspora agenda” and declared “that the only solution to the Jewish problem in Europe was Palestine.” The Jewish State was a game-changer. If the Zionists of Galicia, in practice, veered toward diaspora nationalism, there were other Jews, at the same time and mostly further east, in the tsarist empire, who raised it to the level of theory. In Jews & Diaspora Nationalism: Writings on Jewish Peoplehood in Europe & the United States, Simon Rabinovitch surveys these theories. The first thinker included in this anthology, Perets Smolenskin (1842–1885), conceived of the Jews as a “spiritual nation” bound together eternally by its cultural heritage, “even if we assert that restoring sovereignty to Israel is unattainable.” While he himself was more or less prepared to make such an assertion when he launched his attack on the Haskalah in the early 1870s, Smolenskin changed his mind after the pogroms of 1881 and the emergence of the Lovers of Zion. These mutual national interests are in practice expressed by specific forms of internal self-governance, in the independent organization of popular communal, educational, and religious institutions; in the autonomy of the school curriculum (including its linguistic autonomy); and lastly, by a united voice in parliamentary and social debates that results in distinct national policy. Skeptical of the practicality of Zionism from the outset and irreversibly convinced that it could never provide a solution to the problems faced by the preponderant majority of Jews, Dubnov also had deeper reservations concerning the restoration of a Jewish state. He argued, as the historian Jonathan Frankel observed “that the Jewish nation, lacking a territory of its own, represented the highest form in the evolution of nationalities, dependent as it was entirely on ‘cultural-historical’ and ‘spiritual factors,’ with ‘no possibility of striving for political victories, territorial annexations or the subjugation of other peoples.’” This attempt to develop a benign nationalism is what, perhaps, makes Dubnov and his colleagues attractive to cosmopolitan idealists even today. In The Tragedy of a Generation: The Rise and Fall of Jewish Nationalism in Eastern Europe, Joshua Karlip concentrates on the way in which several Russian-born supporters of autonomism, who were also secular-minded Yiddishists, came to terms with the post-war collapse of their dreams. Less than illustrious but still important intellectuals Elias Tcherikower, Isroel Efroikin, and Zelig Kalmanovitch changed from believers that the “hour of national redemption had come,” with the Russian Revolution, into people who had “largely despaired,” by the late 1930s, “of the ideologies to which they had dedicated most of their careers.” Their experiences with hostile or unsympathetic regimes, in the West as well as in the East, together with the steady “disintegration of the Jewish national collective,” led them to question not only autonomism but the benefits of the entire age of emancipation that had given rise to the idea. Breaking painfully with Dubnov, Tcherikower, for his part, issued a call in 1939 for “a return to the ghetto,” albeit a very ambivalent one. We know that the call backward is in vain. The old sources of religious faith are very dried up, even among the common people themselves. Our generation is too far gone in skepticism, indifference, and criticism to be able to once again bind itself with tfiln straps. We long ago lost the past simplicity of religious faith, and no one has the strength to once again pour old wine into new vessels. But we also do not have the strength to free ourselves from the need for yontev; and from envy of the harmonious religious world of previous generations. We are tired of gray, rationalistic commonplaces. This is a tragedy of the generation that conducts a struggle with itself, a struggle between modernism and its own inheritance. This perception of a tragic dilemma did not lead Tcherikower into passivity. “Although not overtly Zionist,” he envisioned a Jewish exodus from Europe that “echoed Herzl’s vision in Der Judenstaat.” He escaped from occupied France in September 1940 and settled in New York, where he continued—until his death from a heart attack in 1943—his revisionist, counter-emancipationist work in modern Jewish history. Whether autonomism and genuine national rights for Jews as a nonterritorial minority might have taken hold in Eastern Europe largely depends on how one views the historical prospects of the Austro-Hungarian and Russian Empires. The collapse of those empires, and the manner in which they collapsed, was by no means historically inevitable. Allan Arkush is professor of Judaic studies and history at Binghamton University and the senior contributing editor of the Jewish Review of Books. As always Allan Arkush's review article is discerning and illuminating. Soon Gur Alroey's excellent book on Territorialism, "Seeking a Homeland" (in Hebrew) will appear in English translation. Hopefully, Arkush he will soon be able to add a review of that work. The scroll, which was originally a secular technology, became closely associated with Judaism at a time when Christians were adopting the codex for their holy books. Berenson’s teacher Charles Eliot Norton dismissively dubbed Berenson's method the “ear and toenail school,” but Berenson employed the technique in his first book to great effect. 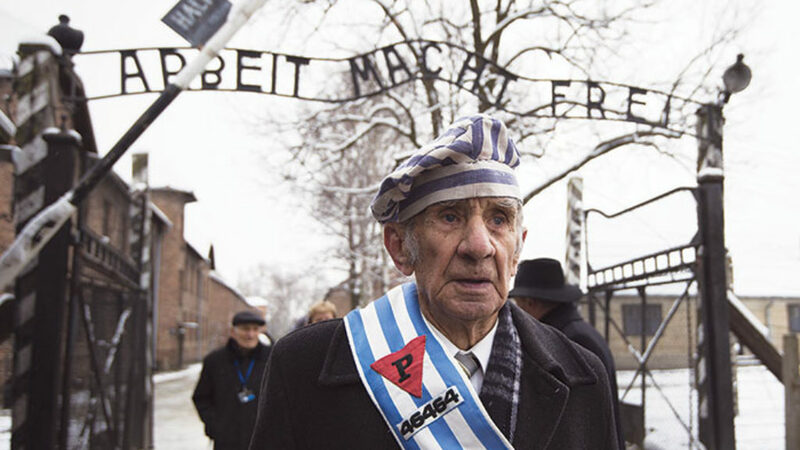 Under the Law and Justice Party, Poland has just criminalized the life stories of its Jewish survivors. Here’s why. As the holiday of freedom approaches, we explore two haggadahs—one old and one new—from our nation's capital, and think about the "audacious hope" of redemption.